How to Incorporate Bicycle Decoration Trend In Your Wedding Decor? From the old-school days of love, running back to movies like Maine Pyaar Kiya, bicycles have become more than just a childhood memory. For couples looking to incorporate elements that are not only unusual and kitschy but also bring about feelings of nostalgia - bicycles have become the “kabootar” of this generation (We are still thinking about Maine Pyar Kiya). Whether it’s a bride or couple entry, a prop or a décor piece, bicycles can be incorporated in the most out-of-the-box way possible. If you and/or your spouse-to-be love biking, then you could probably throw in a bicycle themed wedding. That seems totally offbeat and daring. Then, how about a pre-wedding bicycle themed celebration? 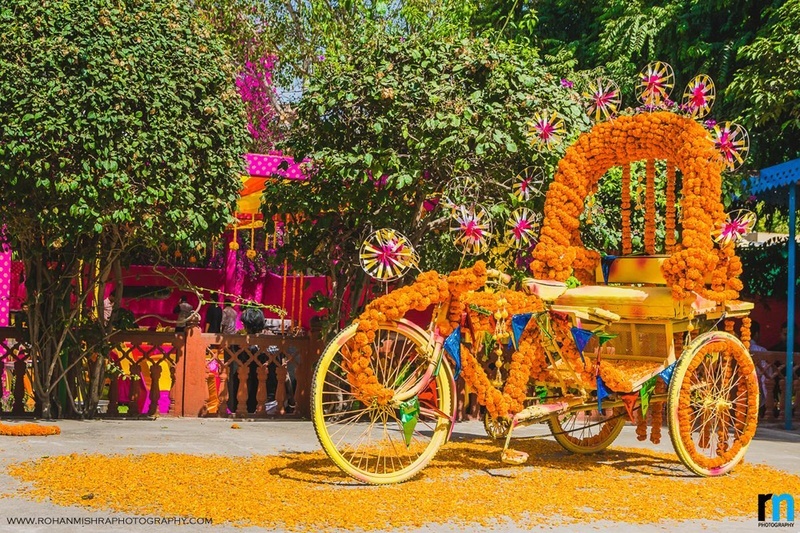 So Brides and groomies, you really don’t need a reason to have a flower laden rikshaw at your wedding. It looks pretty, it looks funky, it looks fun and it makes for superb photo-ops. Enough reasons, eh? Here are a few cool suggestions on how you can get on trend with this wedding décor. Scroll to grab some ideas and inspiration. Having a vintage, tropical or a colour themed wedding, this bicycle decoration can be integrated in the most effortless manner possible. All you need to do is a little of coordination with your florists, juts so you both are on the same page. Firstly, you can start with placing unique signboards. It can either be a sign that welcomes your guests or gives them direction to the main areas of your wedding celebration. Indian wedding without genda phool or marigold is no less than a nightmare (for the oldies). If not in the décor, you’re sure to find these flowers somewhere in your wedding ceremony. They just have to be there, because of their ethnic symbolism. So, if you’re planning to use this flower in your décor, simply get a bicycle or a tricycle to add a fantastic element in your overall celebration. This can play multiple duties as a stand-alone prop, photo booth backdrop or if you’re thinking of a zabardast bridal or couple entry, then don’t shy away. Get on one like a pro, just the way Harbhajan Singh and Geeta Basra did on their wedding. Taking the décor away from the wedding and diving straight into the pre-wedding festivities brings us to mehndi, bridal shower and bachelorette party. A great way to kick start your celebration with all your gal pals in tow. Sit on one of these pretty, fancy bicycle and go on a ride you’ll remember for a lifetime. You could also stack flowers and goodies in the bicycle basket for all the ladies attending your party. As mentioned earlier bicycles can play multiple duties as props, photo booth backdrops or standalone pieces. The bicycle baskets also create an interesting set up where you can place your wedding favours and get your guests excited about the gifts you intend to give them thanking them for attending your big day. Pick an old bicycle, use your own or create a prop, either way they’re sure to create stand out and have your guests take at least one or maybe more pictures around it. Would you put one of these up at your wedding?